There were a couple of new wave power concepts that caught my eye. Thomas Kelly presented ‘Modelling and results for an array of 32 OWCs’ (615 in Track 3). The device he showcased is the Cunamara (Irish for seal), developed by J.J. Cambells and Associates/Wave Energy Ireland. It is a V-shaped structure which weathervanes the apex of the V into the oncoming wave direction. Each arm contains 16 OWCs, which feed into a high pressure and a low pressure plenum via one way valves. There is a unidirectional turbine extracting power across the high and low pressure plenums of each arm. Antonio Falcao’s question after this talk was whether the method of rectification used (one way valves into high and low pressure plenums) was better than the standard method of rectification (bidirectional turbines at each chamber). Thomas answered that this was one of the research questions under investigation. 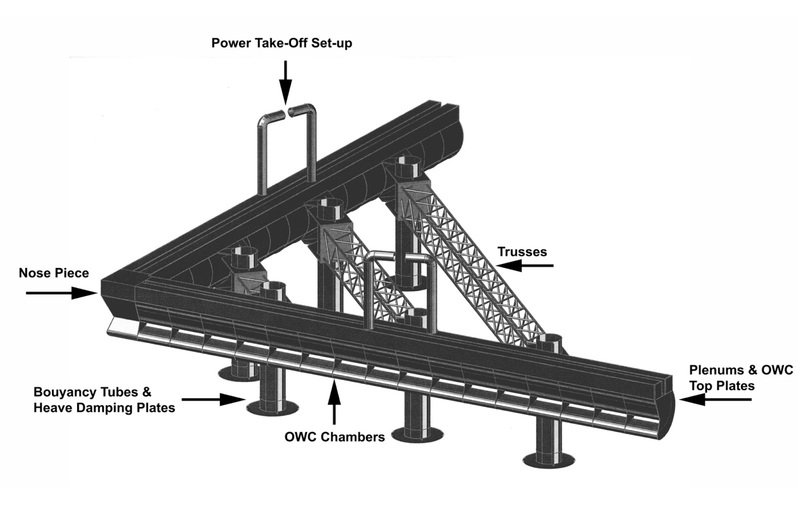 Fig 1 from Kelly, Dooley, Campbell and Ringwood (2013), 'Modelling and Results for an array of 32 OWCs', EWTEC Aalborg. While this concept is intriguing, it does have a close cousin. It is similar to the Bombora device, which is bottom mounted and has submerged pressure cells. There was however a concept presented that works on very different principle to anything I have seen before. It is the ‘CycWEC’ device under development by Atargis. Siegel et al’s paper ‘3D wave radiation efficiency of a double cycloidal wave energy converter’ (548 in Track 5) was presented by Tiger Jeans. The CycWEC is a turbine with two hydrofoils rotating about a horizontal axis parallel to the wave front. 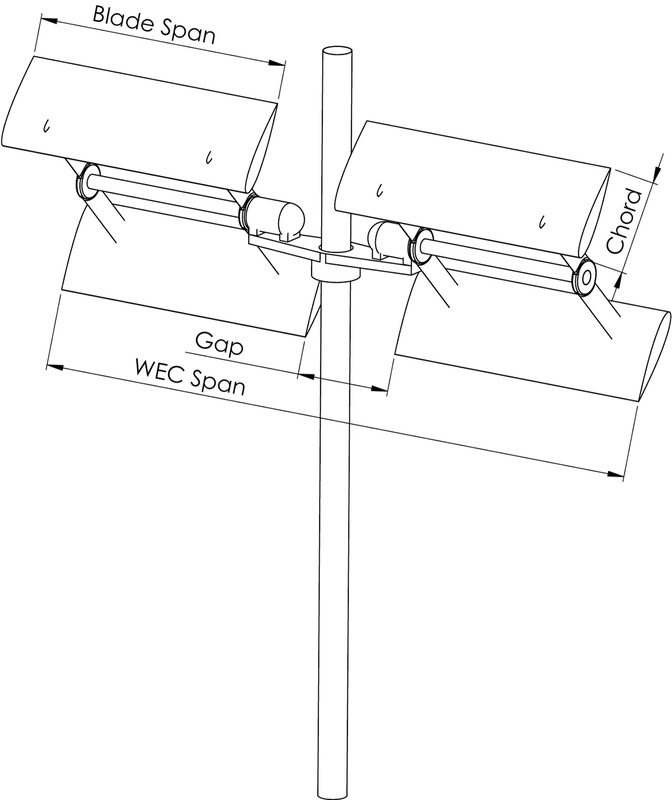 The configuration considered here is a pair of such turbines mounted on either side of a monopile. The turbines can be raised or lowered on the monopole, so that both blades remain submerged for any water surface level. This looks more like a tidal turbine than any wave energy converter I’m aware of. This concept is particularly interesting from a cost of energy perspective because, according to the paper, it focuses radiated waves in the direction of incident wave travel. I’m guessing from its small volume that there is very little in terms of a scattered wave. This suggests the potential for efficient power extraction with a comparitively small working volume. Of course the radiated wave also needs to be the right amplitude and phase for efficient power capture. In fact this is the subject of the paper: it uses a numerical model (previously validated with tank-testing) to show the combined incident and radiated wave field for various geometries. Aurelien Babarit’s question after this talk was whether Froude or Reynolds scaling had been used for the tank tests. Tiger Jeans answered that Froude scaling had been used, but that this had not resulted in the Reynold’s number shifting into a different flow regime. Ed Mackay’s talk ‘Sampling variability and performance assessments of WECs’ (774 in Track 1) gave some interesting insights into why there is such high variability in the performance recorded in field trials. He refers to the variability of data points within each cell of a power matrix. A quick reminder of how a power matrix is constructed from field trial data: Essentially the recorded time series data is split into records of a fixed duration. Average power captured during this record is noted alongside characteristic wave height and period recorded concurrently by a nearby sensor. For each record, the average captured power is assigned to its associated power matrix cell: discrete ranges of characteristic wave height and period. When all the data points in each cell are averaged, the resulting table is known as the power matrix. Placing the wave sensor close to the WEC can increase the correlation between the measured waves and those incident at the WEC. The main focus of this paper was the mapping of this spatial correlation. However, if the wave sensor is too close to the WEC, it could produce a biased estimate by measuring radiated and scattered waves from the WEC, as well as the undisturbed incident wave. The correlation between spectra at two positions depends on special separation and directional spreading of the spectrum. In a wind sea (broad directional bandwidth) the correlation distances are relatively short. In a swell sea (narrow directional bandwidth), correlation lengths were longer: 5 wavelengths down-wave, there was still a 60% correlation. If the wave sensor is at a different wave depth to the WEC, the spectral characteristics will be different. A wide range of spectral shapes can have the same characteristic wave height and period. In the example considered, the variability in the power matrix was mainly due to variation in spectral shapes. Jochem Weber presented an update on his technology performance level (TPL) and technology readiness level (TRL) work (851 of Track 3). He asked whether the technology development paths taken by wave power developers could be improved, so that technology is brought to market quicker, with lower development costs and less risk. Specific criteria were assigned to the nine TPLs. TPL 7 was defined as ‘Competitive with other renewable energy sources, given favourable support mechanism’. Using this definition, he stated that a wave power technology satisfies market entry requirements (first commercial arrays) when it has reached TRL 9 and at least TPL 7. Next he noted that the key indicator of a technology’s value to an investor or vendor is often the technology readiness level (TRL). TRL is strongly related to the amount spent on development in the past. Jochem suggested that a more useful indicator of value is the amount of future spending required to reach the market entry requirements of TPL 7+ and TRL 9. There were some interesting discussions of a couple of long term projects (Wave Star and Fred Olsen). Gordon Dalton presented a lifecycle assessment for the Wavestar (567 in Session 1). He calculated embodied energy, as well as energy and carbon payback periods for Wavestar, and compared these to published results for other WECs and other energy technologies. The comparison was not particularly in Wavestar’s favour from the outset. A hypothetical project was considered, whereby all the components were made in Denmark, assembled in Belfast, and towed to the other side of Ireland (Belmullet) for installation. Nevertheless, the majority of the embodied energy occurred in the manufacturing and assembly phase, while the installation phase made a relatively small contribution. The surprising part was that a significant proportion of the embodied energy due to manufacture and assembly is recovered in the decommissioning phase. This made me wonder how much of the manufacturing capital costs are recovered from sale of scrap after decommissioning. Alan Henry (Aquamarine) asked how Wavestar could beat Aquamarine if playing ‘top trumps’. Gordon responded with something along the lines of 'The advantage of all this embodied energy is that Wavestar will be robust and stay in one piece'. He then went on to clarify that the paper showed that Wavestar was behind competitors, including Oyster, in terms of cost of energy and sustainability metrics such as embodied energy. The purpose of the comparison between Wavestar and its competitors was not to play top trumps, but to show that the metrics for Wavestar were of the same order as those for other WECs, compared to those of competing conventional technologies. This is important as Wavestar’s technology development strategy is to build a pre-commercial demonstrator which will be intentionally over-engineered to ensure survival. Jonas Sjolte presented results from the recent incarnation of the Fred Olsen device, Lifesaver (671 in Session 3). He started with a history of the concepts considered by Fred Olsen. First something like the Wavestar was tested, but with heaving floats underneath the large support structure. The costs and the performance were not promising. Waves over Hs = 3m were required for positive net power generation. Next they considered just one of these small floats. This was up-scaled, resulting in the Bolt device. The tests of the Bolt informed the next incarnation, the torus ‘lifesaver’. This has been tested for a year at Falmouth. The paper presented contains a wealth of information, including power matrices (simulated and measured), the differences between simulated and measured performance, force vs velocity maps, full availability information for various system components, and details of specific technical challenges, such as harmonic oscillations and peak mooring forces. Wave energy is too expensive – cut cut cut! The PTO is expensive; the absorber is cheap; so rate the device to ensure the PTO frequently runs at maximum. Gear as much as you dare. Wave by wave control is required. Nearshore- it will be a long time before wave power is ready for offshore. Hydrodynamics – design for increased pitch and roll response. Service on board – with a stable platform it is easier to service onboard than to remove and fix offsite. On the first evening of the conference there was an announcement of a new journal: International Journal of Marine Energy. It was disappointing that the opportunity had been missed to make this an open access journal, particularly as there is a growing trend in this direction in other research areas (e.g. all Elsevier mathematics journals are open access). However, it is encouraging that Elsevier has recognised the issue and is taking steps in the right direction. While their suggestion of a $3000 fee to make a paper open access might not have many takers, the affirmation of the author’s right to publish an altered version online is refreshing. Note also that the first issue is available free online for a limited time. There were several mentions of open access and open source projects. Cameron McNatt announced the OpenORE website, an INORE initiative for sharing data and open source code. Francesco Ferri’s paper (901 in Track 3) was on the development of a low budget, open source, motion tracking system. It is based on an open source library of functions, ARToolKit. Unlike the industry standard Qualisys, which uses silver balls as reference points, the system being developed at Aalborg uses black and white stickers, each with a unique pattern. This allows the use of one camera only. Jean-Baptiste Saulnier (907 in Track 1) announced that there was free access to data on waves, currents and biology from the Sowfia project. He used this data to estimate extreme waves at various European test sites. There appears to be growing use of OpenFOAM in wave and tidal research. For example, Arantza Iturrioz (581 in Track 3) suggested that CFD is useful for more in-depth modelling useful at higher TRLs. He used a modified version of OpenFOAM for modelling a floating multi-chamber OWC. Owl and duckie: bloggers own photo. Images from EWTEC papers with thanks from the authors, who retain copyright. Thank you to the speakers for checking I'd heard them correctly; spelt their names right etc. Thank you, Ally, for the highlights. The CycWEC team seems to be very active in promoting their device (there is even a Wikipedia entry for it!). It is actually quite hard to find anything that is really new, especially for a WEC. Close cousins to CycWEC would be the rotating foil device developed by Delft University in the late 1980s/early 1990s and the wave rotor device, which was studied at around the same time. I think it is a pity that a new journal on marine energy should be published by Elsevier, as they are known to be a very expensive publisher. Many people, including Prof. Falnes, have signed their names on http://www.thecostofknowledge.com/ to never publish nor review anything for Elsevier. I'd heard about the Ecofys wave rotor (but not since the technology was bought) http://www.ecofys.com/en/news/title_wave_rotor_item/ but I've not seen anything about the Delft University concept. Thank you, I will delve. As for Elsevier, they will change their policies if there is enough pressure to do so. I believe the decision to make the maths papers open access was due to a successful boycott in the US. For the threat of a boycott to be taken seriously, there needs to be a viable (high impact factor, no conflict of interest) alternative. There is none I know of. EWTEC could be a candidate. Adi,you are correct that the TU delft rotating foil is a predecessor to the CycWEC, and is referenced as such in our papers. The Delft team abandoned this work after they concluded that they could only achieve very small efficiency (few percent). Understanding the scaling laws of the device along with operating under feedback control enables the CycWEC to accomplish wave termination, in 2D with very similar results as e.g. the Salter Duck (greater 90% efficient). For the wave rotor device, see Chaplin & Retzler (1996) and Retzler (2000). A patent goes back to 1991 by Retzler. The TU Delft's device (Hermans et al., 1990) was cited in the above two papers, suggesting the close relationship between them. Thanks for this - having mostly attended the tidal tracks, it's good to get some idea of what's happening on the wave side.